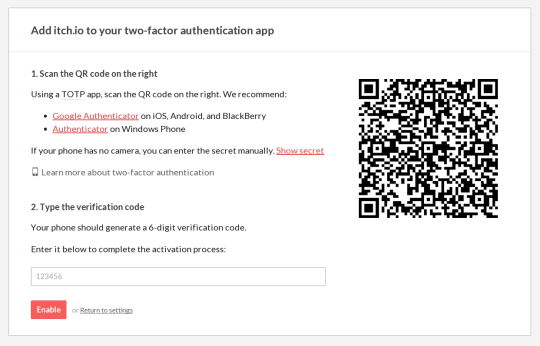 Starting today you can now add two factor authentication to your itch.io account. Two factor authentication gives your account an additional layer of security on top of your password by asking you to provide a code available from your phone to log in. We’ve decided to implement the Time-based One-Time Password algorithm, a standard algorithm used by authenticator apps like Google Authenticator. In order to use TFA, head to the new Security tab on your account settings page. From there you can activate TFA by scanning (or typing) the code into your authenticator application. You’ll also be given 5 scratch codes, one time use keys to bypass the authentication code needed to log in, should you ever loose access to your authenticator. You can read more about this feature on the itch.io guide page. If you’re a seller on itch.io, we highly recommend enabling two factor authentication to help prevent the possibility of someone compromising your payout settings if they manage to get your password.